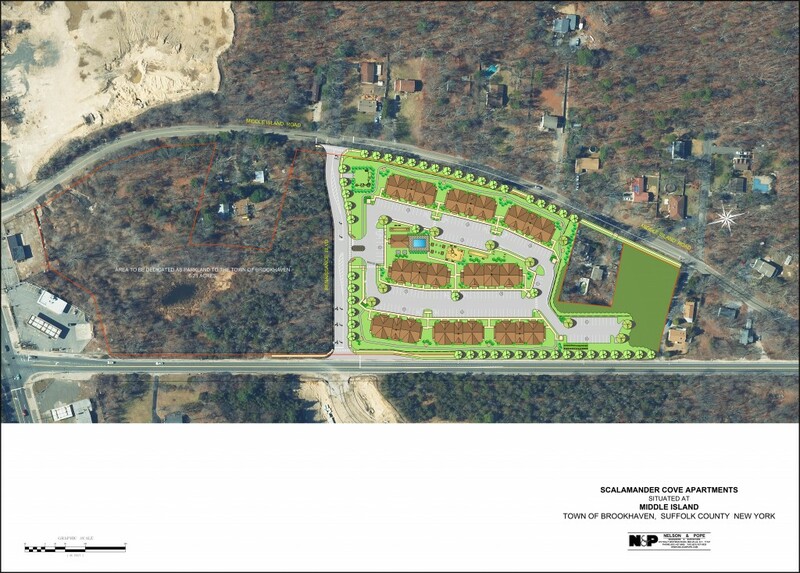 Development of the property behind the Shell station between Routes 25 and 21 that was approved by the Town Board in 2005 for multi-family apartments is moving forward. As you may recall, the property was incorporated into the MCR Land Use Plan in 2005 for development of multi-family residential houses. Since the project was presented to MICA last year, the development plans have been slightly modified. The developer, Scalamander Development, whose principal is Sam Glass, and his consultants met with the MICA Board on October 9, 2018 to discuss the Project. Mr. Glass is an experienced developer who has developed townhouses in South Carolina, renovated the Aqualina Inn in Montauk and, more recently, developed a luxury apartment building at 40 Division Street, Farmingdale (next to the LIRR) and renovated two existing stores located at 155 Main Street, Farmingdale. As was presented in 2017, the project still consists of 8 buildings with a total of 96-units. This number was approved by the Town Board in 2005. 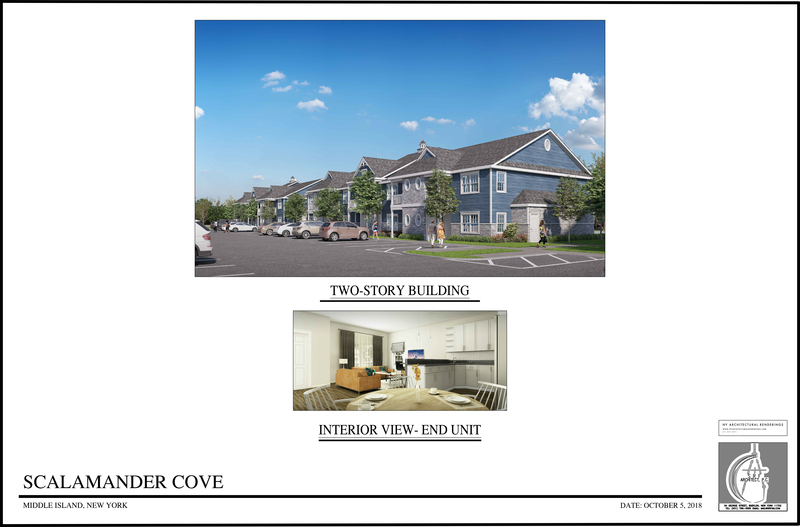 The 2 buildings at the center of the property will be 3-stories in height with the 6 buildings on the outskirts of the property being 2-stories in height. The buildings will feature a mix of 72, 1,000 square foot 2-bedroom units and 24, 700 square foot 1-bedroom units. 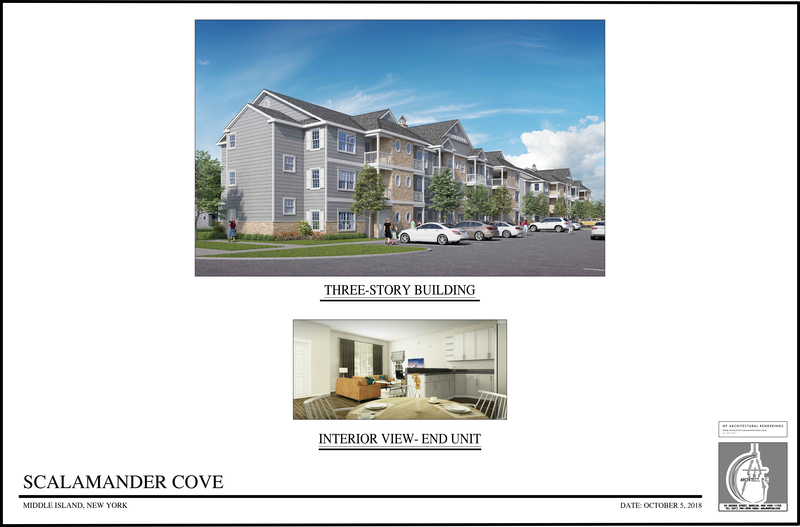 Unlike the prior plan, there will be no 3-bedroom units on the property. The total lot area of the property is 13.35 acres; however, the developers is dedicating more than half of the property – approximately 6.8 acres – to the Town of Brookhaven for wetlands preservation and the expansion of Renaissance Boulevard to connect Middle Island Road with Rocky Point Road. The dedication is over 2 acres more than the 4.52 acres proposed in 2017 and includes the wetland once known as Pfeiffer’s Pond and the western access to the underground culvert for the tiger salamander. Additionally, the project calls for .2 acres of the property to be dedicated to Suffolk County for the widening of Rocky Point Road. This project is starkly different from Renaissance Village. This will be a market-rate project that will feature high-end materials including Hardie Board siding and granite countertops. As required by the Town, the project will include approximately 13 affordable units. The project will feature over 20,000 square feet of recreation area. The recreation area will include an inground pool, a recreation building, barbecue area, community garden, tot play area, and game area with bocce ball, horse shoe pit, chess and checkers. A fitness trail will be constructed around the perimeter of the property with fitness stations throughout the trail. Additionally, sidewalks have been proposed along Middle Island Road, Rocky Point Road, and the Renaissance Boulevard extension. All stormwater runoff will be retained on site and the developer will be entering into a sewage treatment agreement with the owners of Sandy Hill to utilize its existing sewage treatment plant. 1. Impact to the school district/PILOT payments – this market rate project must generate enough annual property tax dollars to offset the costs of educating a realistic estimation of the schoolchildren who will attend Longwood as a result of these new homes. We know you will be meeting with the district and hope you can reach an understanding that fosters BOE support. We plan to meet with the BOE to discuss the Project and hope to obtain the BOE’s support for the Project. However, as we had presented at our meetings, this project is not expected to generate a significant amount of school aged children. Moreover, even with IDA financing we believe the taxes to be paid to the Town will more than cover any increase in costs related to the school district. 2. Traffic light/sidewalks/vehicular & pedestrian safety – the plan presented in 2017 included a traffic signal at Rt 21 AND sidewalks along both the east and west boundaries of the wetland acreage. The current plan doesn’t include either of these — this is very troubling. The traffic signal was a key element of our support of the 2017 plan. The civic intends to fight for the signal. We note only a small section of sidewalk near the wetlands – will these be extended? They must be in order to promote walkability, an essential feature of the hamlet plan. How can new residents walk safely to the library or shopping without sidewalks or a traffic light to help them cross Rt 21? We reviewed the prior site plans we have on file and they do not depict a traffic light at that intersection. However, the applicant supports the installation of a traffic light. At the present time, no formal request has been made for the installation of a traffic light but, based upon our meeting with MICA and hearing your concerns, we will be submitting a request. Please understand that the applicant cannot unilaterally agree to install a traffic light without the approval of the NYSDOT, as it has jurisdiction over that roadway. With respect to your request for sidewalks along the west side of Rocky Point Road, because that land has been designated for wetlands preservation by the NYSDEC, the applicant would need its permission to install them. We have requested a field meeting with the NYSDEC in an attempt to discuss your request. 3. 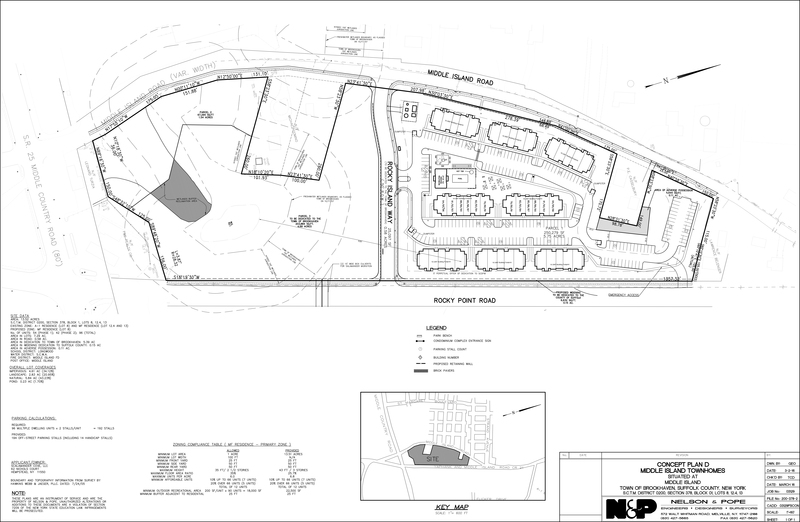 Adequate on-site parking – the original plan had 194 and this one less than 170. Is this within code or will a variance/landbank be needed? We’re not fans of too much parking, but this is a constrained site where additional nearby parking is basically impossible. We believe that there may be some confusion with respect to the prior parking calculations. The prior Belfor plans provided 166 parking spaces. The 166 parking spaces included nine (9) detached garages. Being that the garages would likely be used for storage space, realistically, the Belfor plans provided less than 166 parking spaces. We have removed the detached garages from our plans and have provided 169 parking spaces. 4. Aesthetics/landscaping/appearance to community – we appreciate that upgraded materials and finishes will be used on both the exteriors and interiors. A question was asked about the landscaping. Can we get a list of the planned trees, shrubs, etc? The current site plan does not list any of these. The new nearby 7Eleven/gas station will be replanted with all native plantings — will this site be similarly treated? A Landscape Plan with the Landscape Planting Schedule will be circulated once it is finalized. 5. Who will perform the actual construction now that Belfor is no longer associated with the project? Sam Glass, a member of Scalamander Cove LLC, will be the builder. As stated at the meeting, Sam Glass has successfully developed numerous first rate projects throughout Long Island and in South Carolina. 6. Flooding concerns- local residents remember many periods of flooding during non-drought times. We know that SWPPP requires on-site retention, but how exactly is that accomplished? The stormwater runoff will be stored in below grade drywell structures. These are precast concrete structures with openings that allow the stormwater to infiltrate back into the groundwater. The bottom of the structures is set above the groundwater elevation. Soil borings were performed on-site to determine the groundwater elevation. 7. We believe at least two residential structures will need to come down on this site — would Sam give the MIFD permission to remove them as part of a practice drill? They have all necessary liability, waivers etc, at the ready. Scalamander Cove LLC will give permission to the MIFD to remove the residential structures as part of a practice drill provided that all appropriate insurance policies and permits are in place prior to the drill. 8. Speed limit on Rt 21- would you believe it’s a ridiculous 50 mph there? The civic has been working to get SC to lower it to 30 mph from the intersection of Rts 21 and 25 to Bailey Rd. Would all of you support this safety change? Scalamander Cove LLC would support a reduction of the speed limit on Rt. 21 from the intersection of Rts.21 and 25 to Bailey Road. 9. Emergency access road of Rt. 21 – The Town of Brookhaven Fire Marshal will have an opportunity to review and issue comments on the emergency access points during site plan review. 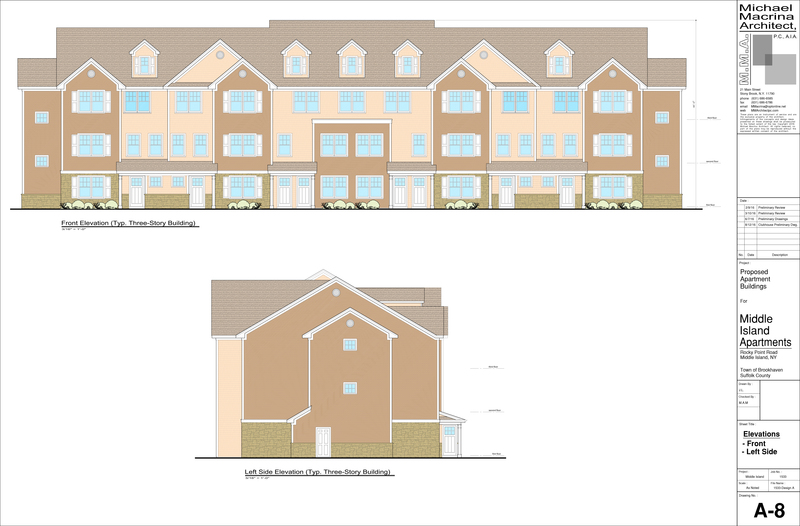 A proposal for a 96 unit, market-rate apartment complex was presented to Middle Island Civic Association members at its March 28, 2017 meeting. Jeremy Longo of Belfor Property Restoration explained that this project will be situated at the northwest corner of Rts 25 and 21, behind the Shell station on property owned by Sam Glass where remnants of an illegal sand mine are still visible. The parcel is part of the trifecta of properties, along with Sandy Hills and old Kogel, originally identified for development of a hamlet center by the community in the visioning charettes of 2002; these were incorporated into the MCR Land Use Plan in 2005. Residents may recall seeing signage for “Town Homes Coming Soon” back in 2008 and 2009. The plan discussed will use the new sewage treatment plant at Sandy Hills, and all storm water runoff will be retained on site. It consists of eight buildings, six 2-storeys and two 3-storeys, the majority being one- and two- bedroom units along with a small number of three-bedroom rentals. These are not being marketed or financed as affordable or special needs units. Walkability — and the necessary sidewalks — are important aspects of this project. The plan features a recreation building, outdoor pool, hot tub, and playground. Entrance to and exit from the complex will be via a new road, Rocky Island Way, which the developer will construct to align with Renaissance Blvd on the east side of Rt 21. Perhaps most importantly, a traffic light will also be installed by the developer at this new intersection. MICA awaits additional info on rental prices, floor plans, anticipated numbers of school age children, and increased tax revenues. More than a third of the parcel, the southern most 4.52 acres, will be retained as open space and dedicated to the Town of Brookhaven. This area includes a wetland once known as Pfeiffer’s Pond, as well as the western access to the under-road culvert for the endangered tiger salamander, required by the DEC.